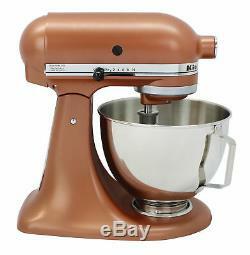 KitchenAid 4.5 Quart Tilt-Head Stand Mixer w/ 10-Speed Slide Control, Copper. Multipurpose Attachment Hub with Hinged Hub Cover. Includes Flat Beater and Dough Hook, Wire Whip. What's in the Box? 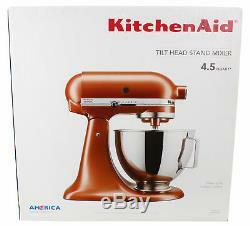 Kitchen Aid Tilt-Head Stand Mixer. The Kitchen Aid 4.5 Qt. Tilt-Head Stand Mixer features a 4.5 quart stainless steel bowl with a comfort handle, 10 mixing speeds, and a tilt-back mixer head design that provides easy access to bowl and beaters. Attachments that come with this mixer include flat beater, dough hook, and a wire whip. Blends ingredients for you to simplify your baking needs. Tilt-head design provides easy access to the mixing bowl. Offer you versatile options to enhance your cooking techniques. For thorough incorporation of your ingredients. Utilizes the mixer's motor to help you complete a wide variety of tasks, from shredding cheese to making pasta from scratch (attachments not included). 16 x 11 x 16 inches. The item "KitchenAid 4.5 Quart Tilt-Head Stand Mixer with 10-Speed Slide Control, Copper" is in sale since Tuesday, March 12, 2019. This item is in the category "Home & Garden\Kitchen, Dining & Bar\Small Kitchen Appliances\Countertop Mixers". The seller is "wholesale_connection" and is located in Nolensville, Tennessee.